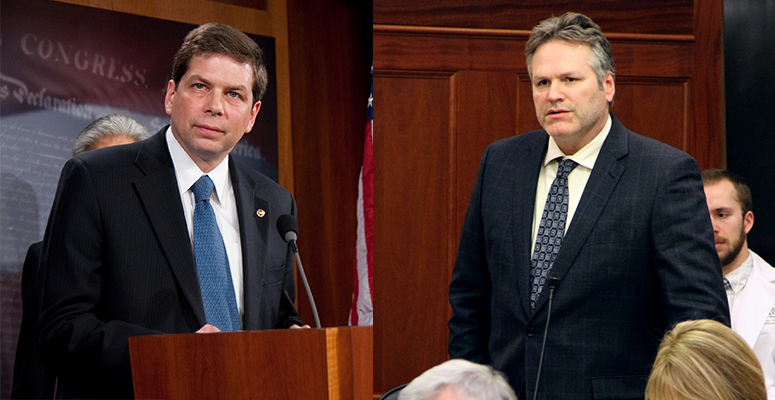 Former U.S. Sen. Mark Begich, a Democrat, and Republican gubernatorial front-runner Mike Dunleavy. Yesterday, we reported on numbers of a poll that pitted Alaska Independent Gov. Bill Walker against Republican front-runner Mike Dunleavy that showed Walker, as of the period covered by the polling, held a nearly eight-point lead over the former state senator. Today, we have obtained additional numbers from the same Ivan Moore-conducted poll that shows an even wider spread in a hypothetical head-to-head race between former U.S. Sen. Mark Begich and Dunleavy. The poll was conducted between March 25 and March 29, and surveyed 761 Alaska adults on landlines and cell phones with a ± 3.6 percent margin of error. The numbers put Begich at 53 percent of the vote to Dunleavy’s 42 percent, an 11-point lead for Begich. 5 percent of voters were undecided, according to the poll. The Walker and Dunleavy head-to-head polling, put Walker at 51 percent to Dunleavy’s 44 percent. Early polling like this is likely not the most telling for what will happen in November, but it’s likely to help shape today’s key decisions. Begich teased a potential entry into the race last year, telling his supporters to “keep your powder dry” in an August letter to supports that acknowledged he was considering entering into the race. He has yet to make any further public statements on his intentions, but it he’s still one of the most talked about potential Democratic candidates for the race. There haven’t been any major entrants into the Democratic field for governor, but thanks to a recent Alaska Supreme Court ruling that allows parties to open their primaries to non-affiliated candidates, Gov. Bill Walker (a former Republican who’s now an independent) could enter the race. It’d be interesting to see numbers on a Walker vs. Begich Democratic primary. 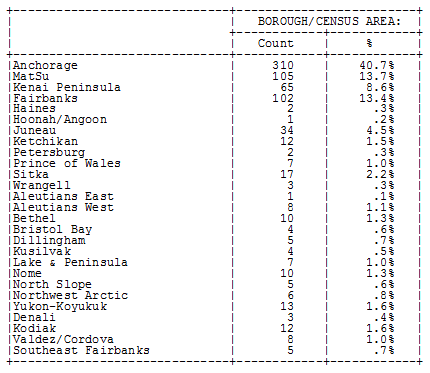 An important takeaway from the polling is that the demographics align pretty closely with Alaska. Here’s the breakdown of respondents per borough. The political breakdown also runs pretty close to the current state voter registration numbers with 27 percent Republican, 14 percent Democrat, 2 percent other party and 56 percent no party. The state voter registration numbers are 26 percent Republican, 14 percent Democrat 5 percent other party and 54.5 percent no party. The self-reported ideological breakdown of the poll respondents was 37% conservative, 17% progressive and 46% moderate. 4 Comments on "Mark Begich would lead Mike Dunleavy 53-42 in head-to-head governor’s race, according to poll"
Mark Begich is Crap and Couldn’t Even Beat Dan Sullivan . Begich Will Never Win Another Election . Sarah Palin Would Beat Mark Begich . Begich is crap, look what Begich and Harry Reid did Senator Stevens does every one remember that, Begich tell us about the airplane full of cash money that never wrecked. I’m voting for Mark Begich and Alyse Galvin. Both candidates accept the reality of climate change and know it is primarily man-made. Climate change is a global crisis and in Alaska 31 villages will be displaced. The IPCC Report is alarming but Alaskans are tough and I know under the right leadership, we can adapt and mitigate climate change. I also support Mark Begich because he will get the PFD (that helps so many Alaskans) constitutionally protected. Mark Begich about air-plane that never crashed when it left Anchorage it was full of cash money and radio operator talked to the pilot when they flew thru Northern California I guess why the FBI biggest man hunt ever because your Dad was in the air-plane. Read the History for the truth America.